Fan mail #1: The listener is originally from Yamaguchi but now lives in Osaka because of work. 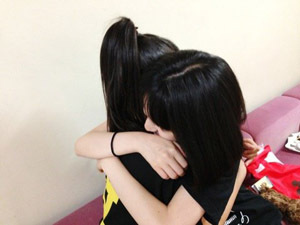 Recently, the listener’s mother found out about their Sayu fandom. While she was kind of “eh” about it at first, she’s since accepted it and is now letting them know about all the TV programs where Sayu is appearing. While the listener doesn’t particularly have a question, they say they’re happy about this new development and that they’ll continue supporting Sayu and the rest of Morning Musume ’14. 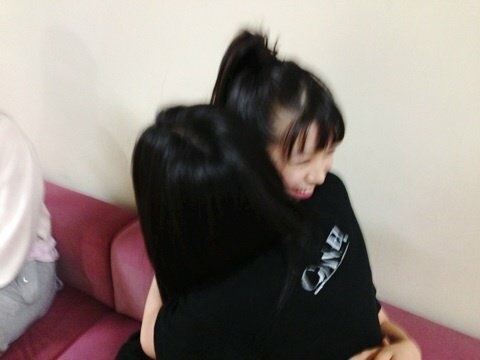 Sayu thinks the mother’s original reaction to her was funny. She figures that they must feel lonely now that their child lives in another city, so learning about their Sayu fandom, she must’ve started finding out about her TV appearances just so she’d have something more to talk about besides the usual “how are yous.” Still, Sayu says she’s really happy hearing about things like this when other family members become involved in the fandom, too. Fan mail #2: The listener asks what Sayu had for dinner yesterday — they wish to know what kind of nutrients help Sayu keep those beautiful looks of hers. 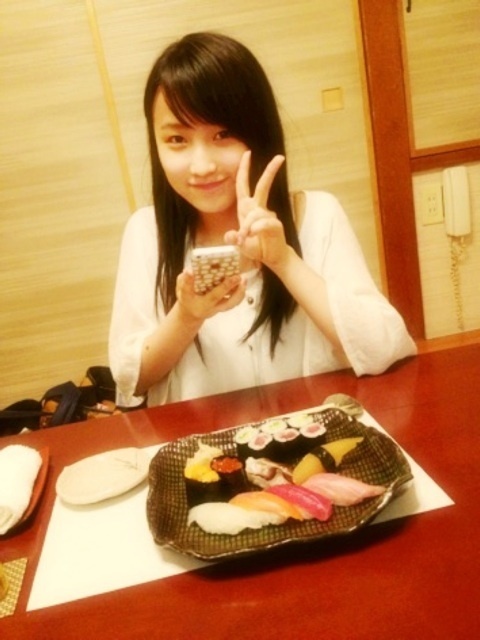 Sayu had a Hello!Con at Nagoya yesterday, so she had the local specialty tenmusu. But as for things she’s been eating outside of work, she recently had some nabe made by her big sister. Usually it’s Sayu’s mom who cooks, but this time her big sister did everything starting from shopping for the groceries and such, and it came out delicious. Sayu’s mom and her big sister are really good at cooking even without using much help from recipe books or the internet, but Sayu needs a recipe that clearly lists everything she has to put in. She can’t grasp any approximates: “just write exactly how many teaspoons I need to put in!“, she complains. While her mom and big sister can just correctly guess the right amounts to put in, Sayu can be looking at a recipe and if it says to do something like add a “small amount” of something, Sayu immediately stops reading and finds another recipe. In other words, Sayu says she doesn’t have much confidence in her cooking skills yet. Fan mail #3: The listener says they’ve been a working adult for about a year now, and in connection to that, they’re recently reading a lot of books from many different genres. The listener asks if Sayu has ever read any books that have had a positive influence on her work or life in general. Sayu says she hasn’t been reading books lately, but one that did influence her was a book about how to become a princess that she read about 10 years ago, right after she’d joined Morning Musume. She explains that although she’s now glad to have been born into the Michishige family, but like all girls, she used to fantasize about having been born a princess — “like the female character in Aladdin who had a tiger living with her in the house and that kind of thing.” She’d ask her mom to make her princess dresses and then pretend to be one. The manga “Sugar Sugar Rune” influenced her in that in some pictures of her recently released personal book, she asked the staff to prepare for her a cute dress like the ones its main characters wore. Fan mail #4: The listener praises Sayu’s new personal book and asks what her friends and family think about it. Sayu says she feels quite confident about her book. She was involved in the very early stages of its planning and it came out just the way she wanted it to — even the outfits were all selected by her. The response to it has been positive from both the fans as well as the people around her. Sayu was especially happy to learn that Rihoriho carries her copy of the book with her. Rihoriho didn’t specifically tell her she does so either: Sayu just happened to notice it one time in their dressing room. Fan mail #5: The listener mentions the recent episode of Rihoriho having went to sushi dinner with Sayu and being extremely nervous about it. Sayu gives us her side of the story. Rihoriho was indeed very nervous about their date: Sayu says you could clearly see it on her face. Sayu is usually a fast eater, but she figured she should just be herself and eat like she always would as otherwise Rihoriho might realize that she’s purposefully eating slowly for her sake. Pretty soon Sayu noticed Rihoriho was eating exactly the same things and in the same order as her. She wasn’t sure if she was copying her or if it was just incidental. Sayu then stopped eating for a bit and asked her what she wanted to eat next, but Rihoriho just gave her a roundabout non-answer along the lines of “hmm… it sure isn’t easy to choose!” But Sayu didn’t give up and said “I’m going to eat this, so you eat something you like, too.” Finally, for just the last three pieces or so, Rihoriho ate something other than Sayu. After the sushi, the two went to a cake shop. It was here that Rihoriho finally seemed to have relaxed a bit which made Sayu glad — she’s pretty sure Rihoriho was so nervous she couldn’t even taste the sushi. Sayu says she hopes to go to dinner by the two of them again and hopefully have Rihoriho enjoy herself a bit more the next time. >Sayu being Sayu, she naturally didn’t object to physical contact with a girl in her low teens. So the dinner date finally happened! Was there a follow-up on RihoDeli?